For there is salvation in no one else, there is no other name given under heaven, whereby we must be saved. When the Lord Jesus died on the cross His death paid the price for all sin, so that all who believe on Him would receive forgiveness of sins and life everlasting. When the Lord Jesus rose from the dead He broke the power of death forever, so that the sting of death and hell is eternally removed, for all who trust in Him. His death is sufficient for it satisfied God’s judgement of sin, in your life and mine. His resurrection is sufficient for it broke the power of death in all who believe. 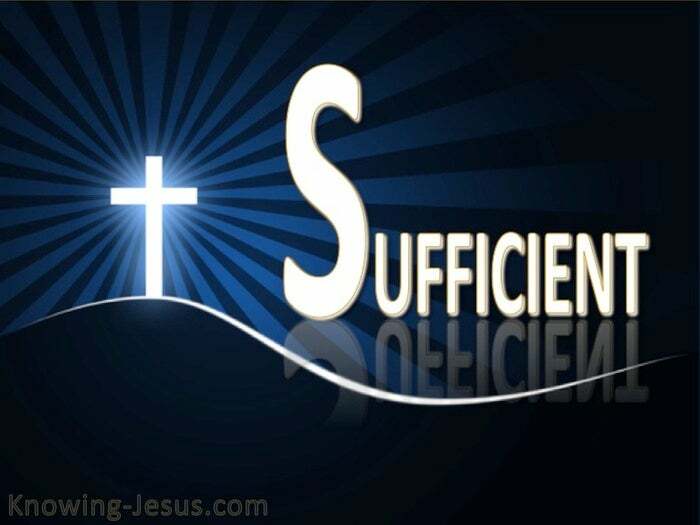 Christ’s glorious sufficiency meets every need in this life and the one to come, and we are fully accepted by God for time and eternity, because of His sufficiency. 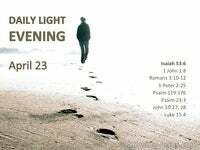 Christ identified with us, so that we could be identified with Him. Christ became sin for us, so that we could be made the righteousness of God, in Him. 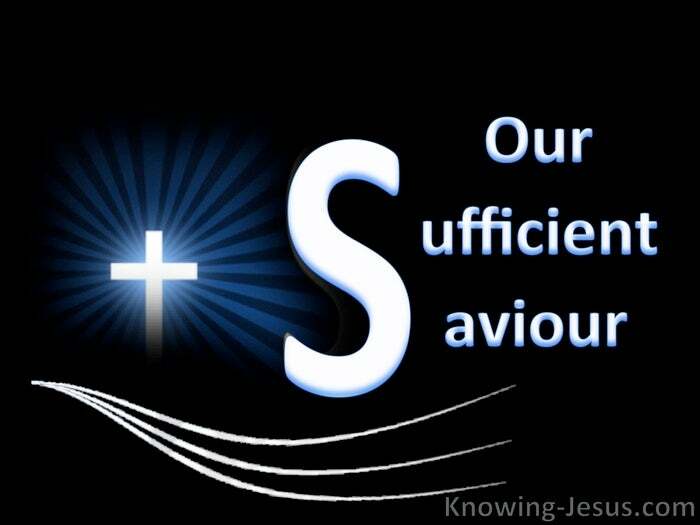 Christ is sufficient for every circumstance of life and He is all we need in everything. As God unveiled His lovely attributes in scripture He slowly revealed Christ to us. He is all we need in the ups and down of life, its joys and woes, for He is sufficient. He is the focal point of all scripture, the great “I AM,” in Whom all revelation unites, for He is the Alpha and Omega of our life, the Beginner and Perfecter of our faith. He is the Holy One of Israel, who gave us our scripture, our promises, our Saviour. 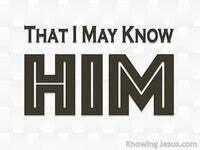 He is the living Word of God, that Promised Saviour to Whom all Scripture points. He is the only begotten Son of God, Who laid aside His glory to become Son of man. He is God with us and was born Immanuel, so we could become His adoptive sons. He is the Light of the world, the only true Light that unbars the way back to God. 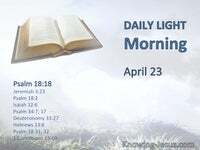 He is the Morning Star, that bright morning star, Who is waiting now, for His bride, and the light of His pure love shines into the hearts of all who trust in His name – and He shows us the way, for He is the only Way into the Father-heart of God. He came to rescue us as our Good Shepherd, for we are sheep without a shepherd. He came as the perfect Lamb of God to pay the shocking price for sin – and He is coming as the Lion of the tribe of Judah – the victorious King of kings. 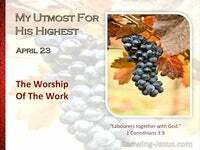 The sufficiency of Christ equates to our every need in this life and the one to come. We are fully accepted by God for time and eternity, because of His sufficiency. 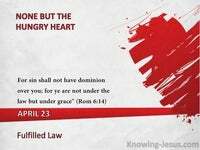 The wonders of Christ sufficiency should stagger the mind and humble the heart. There is nothing we can do to get right with God except believe on the Lord Jesus – but those that accept His free gift of salvation discover Him to be sufficient.